Since it is October, and since Cap'n Howdy's Blogorium could be described as "horror themed" in its layout, I guess I should make with the reviewing horror movies that won't be a part of our annual celebration in two weeks. Fortunately for you, dear readers, I have a shelf full of horror flicks waiting to be discussed. We'll start this semi-regular column with 1971's The House that Dripped Blood. I've made no secret of my love for anthology films, specifically those coming from Amicus Productions, so it was a surprise to me to discover that I'd never gotten around to watching The House that Dripped Blood. It turns out that House is a pretty good addition to their collection of supernaturally based horror films. The cast is great, the direction is atmospheric, and most of the stories work in context. 1. A writer (Denholm Elliot) and his wife move into the house in question so he can finish his macabre masterpiece. When his creation, a mad strangler named Dominick, starts to appear in and around the house, he's convinced his grip on reality is slipping. 2. A recently retired businessman (Peter Cushing) moves into the house, and while wandering the nearby town, finds a wax museum of horrors. He becomes obsessed with a figure of Salome that reminds him of a long lost love, and when a visiting friend goes missing, the terrible secret of the museum comes to light. 3. A not-retired businessman (Christopher Lee) and his daughter (Chloe Franks) come to the house to get away from the city. When a tutor (Nyree Dawn Porter) begins to connect with the distant and sheltered child, her true nature comes to light, with terrible consequences. 4. An actor and horror-buff (Jon "The Third Doctor" Pertwee) and his co-star (Ingrid Pitt) rent out the house while he's filming Curse of the Bloodsucker. Convinced that his cape looks too cheap, he visits the mysterious Theo Von Hartmann's shop and buys an authentic vampire cape. Maybe a little too authentic, as he discovers when he puts it on. I think the third and fourth stories were my favorite. Admittedly, the Jon Pertwee story gets quite silly in the middle (especially when he puts the cape on after midnight and reacts hammily to his fangs and... flying), but it is salvaged by Holloway's visit, one that ties up the film nicely. The first story, about the writer and his mad killer, suffers from a rushed ending, one that relies on you paying attention to a last second development based on a character you just met. The set up is wonderful, and most of the lingering architectural shots and creepy ornaments does soften the weak ending. Despite the really trippy dream imagery in the second story, the ending just doesn't make sense. Something happens to the wax figure that, if what the owner says is true, would render it impossible to be fixed in time for the last shot. The final image, on the other hand, is a pretty good one. Despite the fact that the film (rated PG) is virtually bloodless, there's plenty of atmosphere and suggested horrors to raise a bit of a chill. This is more evident in the witchcraft story with Christopher Lee, which relies entirely on suggestion for its gruesome finale. 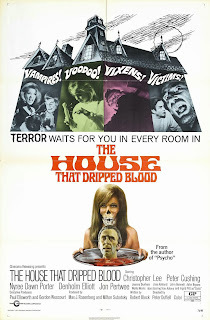 The House that Dripped Blood isn't as gory as Tales from the Crypt or From Beyond the Grave, and it might come off as a little tame compared to what was to come. 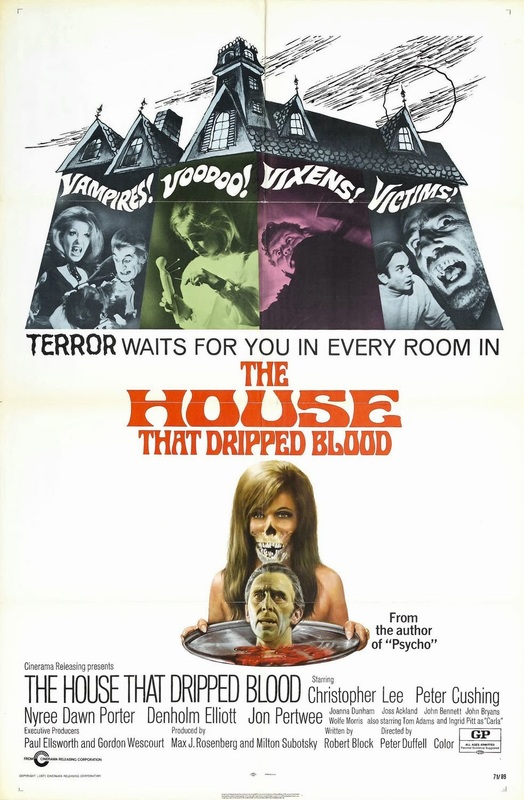 However, taken with the much earlier Dr. Terror's House of Horrors, I think House fits the Amicus m.o. Finally. the title is a little misleading, because while the film is about four tenants who died (separately) in the same house, at least two of the stories really have nothing to do with house as evil. They attempt to tie everything together with Stoker directly addressing the audience (something that seemed strangely familiar, although I'm convinced I've never seen this before), but if you're willing to put the misnomer of the title aside, it's a fun little spookshow you could probably scare children with - and not scar them permanently.